Many of us have heard of bitters, but aren’t really sure what they are besides an ingredient in old-school cocktails and another generation’s remedy for unsettled stomachs. The nostalgia associated with bitters doesn’t mean they’re not current, however. Bitters are making a comeback in restaurants and bars, and we’re making it easy to join the classic cocktail revival with handcrafted organic bitters and tonics from Vermont. Jovial King, a practiced herbalist, has achieved just the right balance of old and new in her refined bitters. Through her venture, called Urban Moonshine, Jovial harnesses the power of local plants to create intense flavoring agents by steeping herbs, roots, leaves, berries and fruits in alcohol. You can choose her Original blend, Citrus flavor or Maple bitters. We’re also featuring Urban Moonshine tonics, which are medicinal bitters such as Immune Zoom for fighting the common cold. These organic bitters and herbal tonics are packaged in glass apothecary bottles that perfectly capture the classic-yet-exotic spirit of Jovial’s creations. Meals often don't include bitter tastes, but it’s important for healthy living, Jovial explains. You can spray the bitters right on your tongue, and they’ll act as a signal to your body to stimulate digestion. 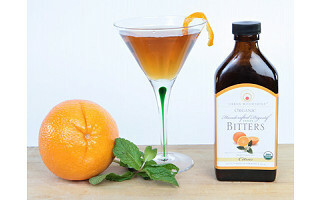 For festive occasions, you can add Urban Moonshine bitters to cocktails to complement other distilled spirits, such as gin. You’ll only need a few drops to make your favorite martini more flavorful, since the alcohol content of bitters can reach 45% or higher. And should you happen to overindulge, bitters make a great hangover remedy, too. Hi Daily Grommet fans! My name is Jovial and I am the founder and formulator of Urban Moonshine products. I have studied herbal medicine for years and have learned from the finest teachers. Our mission is to bring herbal medicine back into the modern world. Our products embody beauty, simplicity and the best quality ingredients. We hope to inspire your relationship with health and the world around you. I am here to answer any questions that you have. I am excited to have Urban Moonshine be today's Grommet! I just wanted to make one clarification about Tonics. They are not actually bitters but in their own classification as herbs that build, strengthen and tonify. Tonics work best when taken over time... days, weeks and months. It takes time to strengthen your immune system or your energy levels. In the end wellness is about staying health and preventing sickness not just treating the symptoms that occur once you are not feeling well. To your health! I have been having a gurgly intestine recently and have been trying to figure out what I am eating that has been causing it. Do you think that bitters could help with this? What about those of us who don't drink? It sounds like this is an additive, and not a way to get high. Is this like vanilla extract, where just a few drops is enough to get the flavor? Thanx. Our products do contain alcohol but they are not considered an "alcoholic beverage". You take a very small amount on a daily basis to maintain wellness. As far as our bitters go, yes it is similar to vanilla extract in the way that it acts as a flavoring. You can add a small amount to your beverage of choice and get a fantastic herbal aromatic flavor. Enjoy! 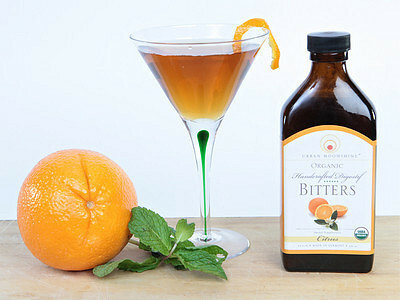 Another great use for bitters, taught to me by a bartender when I had a bad case of the hiccups: He took a a cocktail sized slice of orange, put a few drops of Angostura Bitters and a few drops of sugar syrup on it, and had me eat the fruity part of the slice, no rind. My hiccups were gone instantaneously. I'm sure your bitters will work just as well. They sound terrific. Has anyone tried the bitters for fibromyalgia and chronic fatigue. I would love to here any comments. Thank You. @Mandie: I will see if Jovial is familiar with anyone having success with these issues. It would be great if these could help ease your symptoms. @Katherine Klinger: this is what I have been looking for I have it and about 9 other things wrong. But I am desperate to have help I pray to God it does cant stand the pain along with Neuropathy. @Laura Enfinger Rogers: See Jovial's response below. She says it is a good place to start. I hope that you are able to find some relief from your symptoms. @Mandie: Bitters are not specifically indicated for fibromyalgia or chronic fatigue, but improvement in digestion tends to create improvement in over all health. The root of good health is great digestion and bitters are a perfect place to start. Many of us have heard of bitters, but aren’t really sure what they are besides an ingredient in old-school cocktails and another generation’s remedy for unsettled stomachs. The nostalgia associated with bitters doesn’t mean they’re not current, however. Bitters are making a comeback in restaurants and bars, and we’re making it easy to join the classic cocktail revival with handcrafted organic bitters and tonics from Vermont. Jovial King, a practiced herbalist, has achieved just the right balance of old and new in her refined bitters. Through her venture, called Urban Moonshine, Jovial harnesses the power of local plants to create intense flavoring agents by steeping herbs, roots, leaves, berries and fruits in alcohol. You can choose her Original blend, Citrus flavor or Maple bitters. We’re also featuring Urban Moonshine tonics, which are medicinal bitters such as Immune Zoom for fighting the common cold. These organic bitters and herbal tonics are packaged in glass apothecary bottles that perfectly capture the classic-yet-exotic spirit of Jovial’s creations.